As always, the main party of the York Factory Express began its journey at Fort Vancouver, on the Columbia River, shortly after March 20th every year. It was a tradition that every man, woman and child in the fort came down to the river bank to wish the express-men goodbye. It would be a long journey. 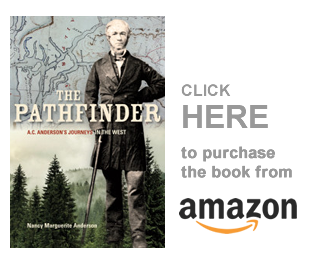 They departed in mid-March and normally returned to Fort Vancouver in early November — more than seven months later. The passengers who traveled in Edward Ermatinger’s outbound express boats were Chief Factor John McLoughlin, Chief Trader Alexander Roderick McLeod, botanist David Douglas, Clerks Pierre Chrysologue Pambrun of Fort Nez Perces, and Francis Noel Annance of Thompson’s River. Ermatinger’s journal began with these words: “March 1827. Tuesday 20th. Fair weather. The Express Boat leaves Fort Vancouver at 1/4 before 6pm. A second Boat accompanies us as far as the Chutes to assist in carrying our Boat over them and to strengthen the party… Proceed 3 miles and encamp.” Traditionally the voyageurs received their regale of rum the first night out, but the express-men also camped close to headquarters so a man could be sent back to pick up anything they had forgotten to pack in the boat. The first major hurdle the express men faced was the Cascades Portage, where they pushed their way through the range of mountains east of Fort Vancouver. The Cascades was a foaming chain of rapids that rushed toward them around a sharp bend in the river. At the portage’s base they emptied the boats and tracked them upriver with lines. The provisions and trade goods they portaged over the narrow, slippery four-mile trail along the river bank. “22nd. Rain most of the day. Clear the Cascades Portage by 1/2 past 11 o’clock. Sail and paddle the rest of the day. Encamp a little below Cape Horn at 6 pm.” Cape Horn, which got its name from the fact the wind blew fiercely there, stood on the Columbia’s south bank 72 miles above the fort and across the Columbia from the mouth of Klickitat River. “23rd. Start at 5 am. Breakfast below the Dalles (discharged part of our baggage) at 6 pm.” The fur traders continued to push their way upriver through the mountain range, and the Grand Dalles was their next major barrier. In 1826 Aemelius Simpson, then a new-comer to the fur trade, described the Dalles as “a long & intricate chain [of rapids] rushing with great force though a number of narrow & Crooked channels, bounded by huge Masses of perpendicular Rock, the faces very much fractured…” To pass by these rapids the men used a nine-mile long portage which generally took them an entire day to traverse. Somewhere along this portage, the countryside changed from the lush forestland of the coast, to the dry desert of the interior, so quickly it was as if a fine line was drawn in the dust. Rattlesnakes sunned themselves on the rocks, and the men must watch where they stepped. The Dalles was followed by the Chutes, that forced the rushing river into a narrow rocky passage where it fell 20 feet almost immediately and continued to tumble down rocky rapids as it carved its way to the Pacific. These men were heading upriver, however, and they avoided the hazards of the Chutes by portaging both loads and boats on their shoulders over a narrow trail along the river banks. “24th. Fine weather. Start at 5 am. Pass our Baggage and Boat and clear the Chutes portage by 11 am.” They took only one boat across the portage. “The other boat and crew return to the Fort. Hoist sail with a stiff breeze. Dr. McLoughlin and Mr. McLeod remain behind to hire horses to carry them to Walla Walla [Fort Nez Perces]. Encamp 3 miles above [John] Day’s River at 5pm, having waited for the Doctor and Mr. McLeod who were unable to procure horses. They left [Jean Baptiste] Ouvre with Indians who had sent for horses which he was to bring up. He arrived after dark with 5 accompanied by 2 Indians. Being ahead of the Indians, escorted only by Baptiste, a slave, he was attacked by 4 others who wish to pillage him. They, however, cut them off and took their arrows away from them which Ouvre brought with him as the spoils of war. “Sunday 25th. Fine weather. We are unable to agree with the Indians for the loan of their horses, therefore the gentlemen walk by turns to lighten the boat which is insufficient to carry all the baggage and 6 passengers plus an extra man and the Indian Slave. Proceed at 1/2 past 5. Hoist sail with a light breeze which continues all day. Assist with the Poles and Paddles. Encamp about 6 miles below the Gros isle.” This is the fur traders’ Big Island, or Blalock Island. “Monday 26th. Some light rain at noon — rest of day fine. Embark at 5 am. Breakfast at 10 at the tail of the larger island. Proceed to the end of it. Find Indians with horses — hire 3. Ouvre returns to our breakfast place in search of a gun left there by mistake. Encamp at 3 o’clock to wait his return. “27th. Fine weather. Two men who went with Ouvre return early this morning and inform us that he has gone in pursuit of an Indian who had watched our departure and made off with the gun. At 8 o’clock Messrs. McLoughlin, McLeod and Ermatinger take horses and arrive at Walla Walla [Fort Nez Perces] at 5pm. The boat starts at the same time — sail wind. Encamp above the Grand Rapid.” This was the Grand or Umatilla Rapids, a long and dangerous rapid that ran through a narrow canyon with perpendicular walls, eighteen miles below Fort Nez Perces and a few miles above the mouth of the Umatilla River. From early years the fur traders traveled the Columbia River in boats rather than canoes. These boats were for the most part clinker-built bateaux with flat bottoms and narrow beams, lighter in weight than the HBC’s York boats used on the other side of the Rocky Mountains. These boats afforded easier passage up the long and steep portages that existed along the Columbia River. These craft were both rowed and paddled, and their seams, which opened in the heat of the sun or the stress of the rapids, were pitched and gummed frequently to keep the boats afloat. The gum the men used was a mixture of sawpit resin and tallow and they melted the pitch into the seams of the boat by drawing a burning piece of firewood along each seam. To a stranger, it appeared as if the voyageurs were “burning their boats behind them.” [Source of quote: James Robert Anderson: Memoirs, p. 140. James was son of Alexander Caulfield Anderson]. Coming next, but not necessarily the next blogpost: YFE, Fort Nez Perces to Fort Colvile. Which journal shall I chose to publish, I wonder? This one is excerpts from Edward Ermatinger’s 1827 York Factory Express Journal, online at “Peel’s Prairie Provinces,” University of Alberta Libraries. Ms. Anderson. I really enjoy the grasp you have of the subject of fur trading in the PNW. You have provided quite a bit of fascinating reading here. I am an amateur historian, am writing a work called The Native Struggles of Washington Territory. I am from Wenatchee and Yakima originally; Leschi and his father married into the Yakama tribe, so the mutual history of these tribes is relevant. 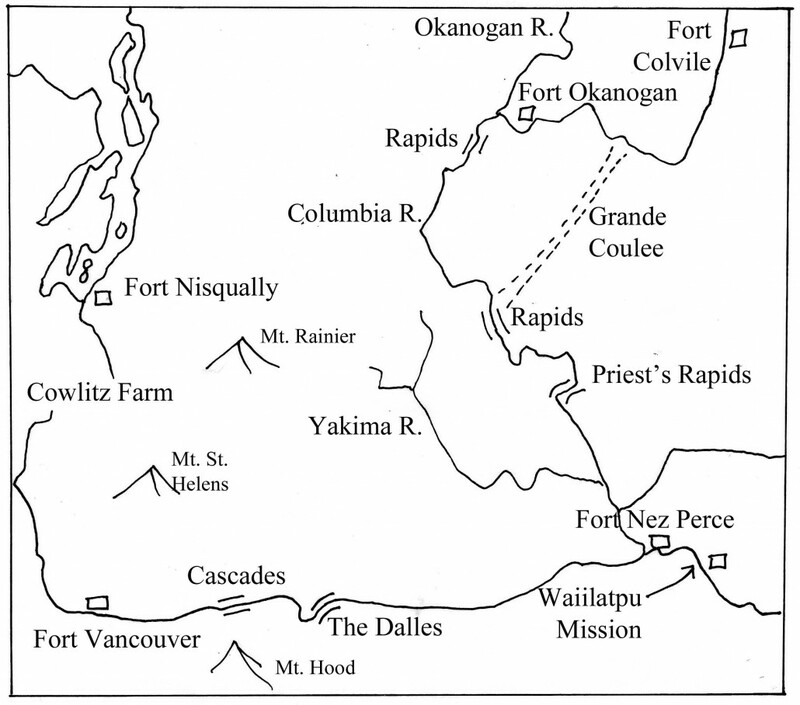 I came across the Descendents of Ft. Nisqually group in several internet searches. Ms. Lincoln’s identification of the locations of the claims of the Muck Creek Traitors and of the Naches Trail in Spanaway was very, very satisfying to me. Thank you. There is a lot of knowledge in those groups, and they are always willing to share!